Some days ago I was walking on the street and passed by a beverage store where I saw some bottles of absinthe. There were green, red and blue versions, and I thought how could absinthe, a classically green colored beverage, be transformed into a totally different color; and what's more, a primary color which is supposed to be impossible to create by mixing other colors. Absinthe is always green due to the presence of Artemisia absinthium's chlorophyll. The beverage is based in and some kind of product is added in order to create a reaction to make it turn to X color. Absinthe is transparent until you add the Artemisia absinthium's chlorophyll. Somehow, you can add colorant to the transparent beverage and eliminate the chlorophyll. Absinthe is made much in the same way that many gins are. You take neutral spirits, add botanicals (wormwood and anise), and re-distill. Anything that comes out of the still will be clear. Some absinthes at this point are finished, these will be called blanche (white) or sometime la bleue. The first absinthe available in Val-de-Travers (the birthplace of absinthe) after the ban in Switzerland was lifted was a blanche. That same bottling was the driving force behind making it legal in the United States (interview of lawyer who fought the ban). It can be really good stuff. Any of these can be really easily colored. Usually absinthe gets a second chance to mingle (macerate) with some herbs after it's sprung from the still, this style is known at verte. This is when it gets it's color, as well as some extra flavor and aroma. It's a more complex flavor. The color that the chlorophyll imparts is dull. If it's neon green there was food coloring added and some of these "greener" varieties are actually blanche at heart. Also of note is that sometimes these food colored types add sugar, to make it friendlier to less experienced drinkers (or to hide poor distillation technique as happens with vodka). There is at least one non-green bottling that I know of that is still macerated post distillation, but uses hibiscus which turns it red. These methods of coloration don't make them any less of a true absinthe, they do use wormwood (and equally important, anise). The most common non-green "absinthe" is so called Czech-style, also known as Bohemian style. These are not rightly called absinthe and are historically known for very low quality. Instead of distilling the botanicals in the alcohol, they are cold compounded. It's made either by mixing spirits, flavoring oils, and food coloring or by macerating the botanicals without distillation. Be wary of absinthes much over 140 proof, as they are frequently Czech-style. Do be aware that they're called Czech-style because that's where the style originated and where most of this variety still comes from, however the Czech Republic does have good examples of absinthe. I am going to put my two bits into this question also. 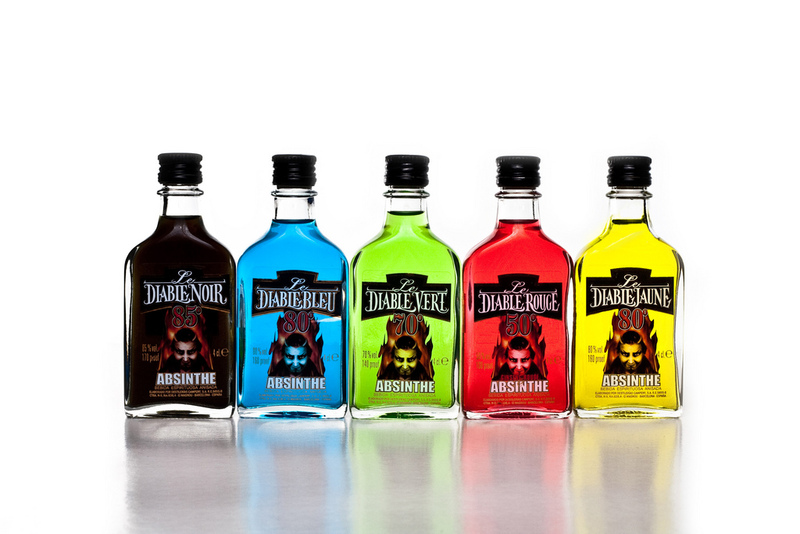 There are several existing colored absinthe on the market at the moment and a couple of ways to get various colored varieties. Artificial coloring is the most common. Absinthe may be found in the following colors: Green, Red (or Rose), Yellow, Brown, Clear and Blue. One way to get the desired colored is to make your own absinthe as can be seen in the following recipe. There or other non-traditional herbs and artificial coloring agents that are used to make a particular color also. Green absinthe – classically natural color of absinthe. Color can vary from deep emerald to light green or olive shade. Practically every manufacturer produces green absinthe. But because the natural dye (chlorophyll from the leaves) is not durable therefore manufacturers in most cases use artificial coloring. To preserve natural green color of absinthe it is bottle in green or brown bottles. Yellow absinthe – is usually natural colored because natural dye from chlorophyll has a tendency to lose its color and become more yellowish in couple of months after production (aging of absinthe). Red absinthe – is colored by extract of pomegranate or macerated with blossoms of hibiscus what gives absinthe light-ruby shade and original after-taste. But nowadays majority of red absinthes are artificially colored. Many contemporary absinthe critics simply classify absinthe as distilled or mixed, according to its production method. And while the former is generally considered far superior in quality to the latter, an absinthe's simple claim of being 'distilled' makes no guarantee as to the quality of its base ingredients or the skill of its maker. Blanche, or la Bleue: Blanche absinthe (also referred to as la Bleue in Switzerland) is bottled directly following distillation and reduction, and is uncoloured (clear). The name la Bleue was originally a term used for bootleg Swiss absinthe, but has become a popular term for post-ban-style Swiss absinthe in general. As noted in Montijello's excellent answer, clear absinthe may be easily artificially colored. I'll take a stab at this... Absinthe is an unregulated name unlike something like Champagne which is highly regulated name/place. With Champagne you can only use Pinot Noir, Pinot Meunier and Chardonnay in making it and it has to be grown in the Champagne region. Absinthe can be made by any distiller anywhere in the world. What that means is that you could put whatever you want into a bottle and call it Absinthe (within liquor regulations). True that traditional Absinthe is a green color, from wormwood, but using other herbs or plants could change it a different color. But a quick look around the web yielded several wildly colored examples called Absinthe. So, if it bugs you, only drink green Absinthe and ignore the rest. Not the answer you're looking for? Browse other questions tagged brewing ingredients colour absinthe or ask your own question. How can I brew a black lager?